I received this Masterbuilt smoker for review. As always, all opinions are entirely my own. Masterbuilt, where have you been all my life? I’ve had two other smokers before, both of which I used a grand total of…two times. Ever. They were a hassle to use, had virtually no features, lacked the ability to make adjustments…and just plain weren’t fun. So they got stuffed in the garage…or sold at a garage sale…heck, I’m not even sure where they are. They’re around here somewhere. I think. I’ve used our new 30″ Masterbuilt Digital Electric Smoker four times in a week (that says it all), including smoking ingredients I’m going to be using for some canned condiments. It’s so dang simple to use and with great results! But before I get ahead of myself, let’s take a look at the setup and features. Assembly was pretty easy and straightforward. It took my husband about 40 minutes to get everything set up (yes, I delegated that job to him.) We also got the smoker cover and a set of Carve and Serve Gloves designed for handling anything hot during and after the smoking process. The door latch is also adjustable to allow you to get a super tight latch so no hot air escapes. 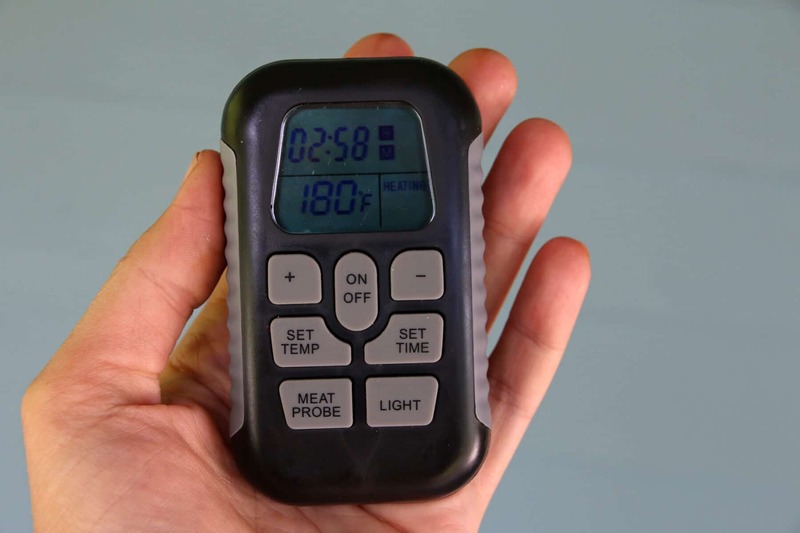 A super nifty feature, the RF remote controls on/off, temperature, time, light and monitors internal meat temperature so you don’t have to keep going outside to check on it. Adding wood chips throughout the smoking process couldn’t be easier. The Masterbuilt smoker features a patented side wood chip loading system that allows you to add chips without opening the smoker door. Now let’s test put this smoker to the test! Next up I wanted to make some Mexican pulled pork burritos and I wanted to experiment with pre-smoking the roast before adding it to the slow cooker. I set the temperature to very low and added a few doses of wood chips. Just long enough to smoke the roast without cooking it through. 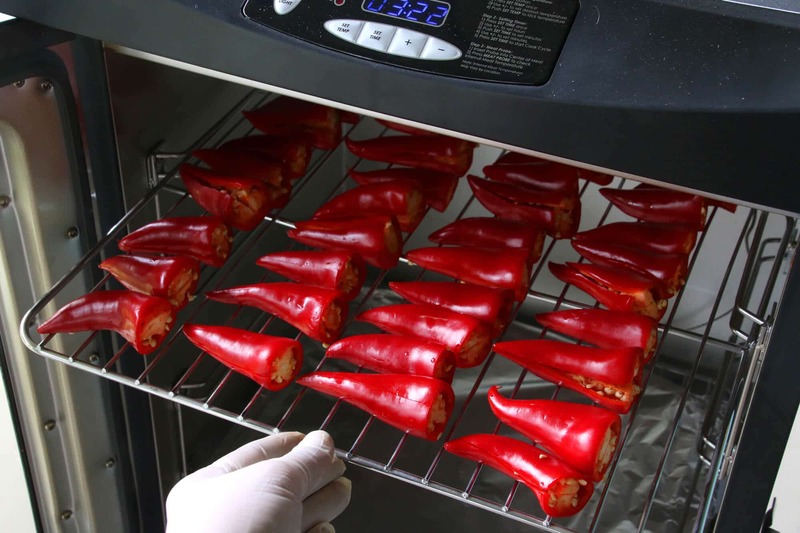 With the success of my smoked chipotles I next smoked a variety of peppers which I later finished off drying in my food dehydrator to use for grinding my own smoked pepper-based rubs and adding to stews. Poblanos, serranos, Anaheims, habaneros…absolutely smokin’ beauties! 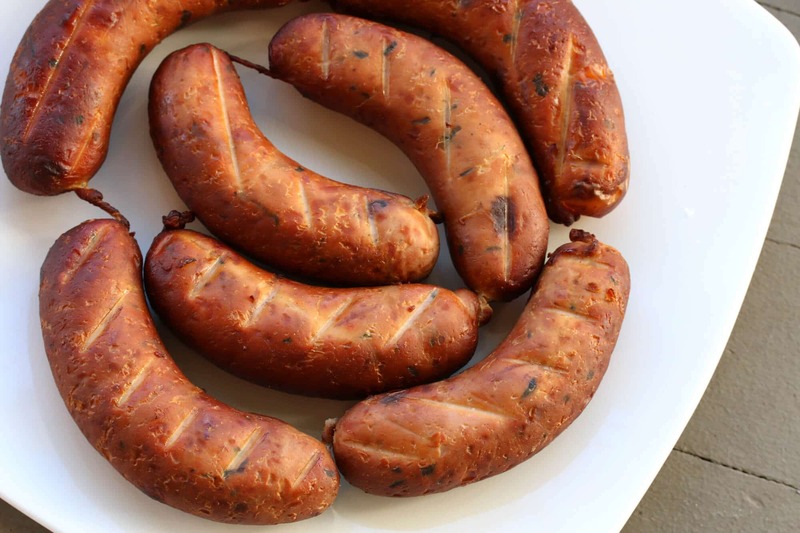 Then it was time for something ultra delicious – smoked homemade sausages! Normally I would have just fried these up like regular brats but I wanted to smoke this batch and create a sliceable smoked sausage that we could enjoy with cheese and crackers. Since making these sausages I’ve picked up Masterbuilt’s Sausage Hanger. I am soooo excited to put it to use making more sausages, including my own hard salamis! Additionally, I also got the Rib Rack for perfectly smoked ribs and the Fish/Veggie Mat for perfectly smoked fish and which will be super helpful for smoking peppers and other smaller items that could fall through the grates. And here’s a Masterbuilt Accessory Kit that includes the rib rack, fish/veggie mat and some heavy duty gloves to protect your hands from heat and while carving. While the sausages were smoking, out of nowhere I had this idea for another dish: Smoked Jalapeno Mashed Potatoes. So I threw jalapenos in the smoker and whipped up the potatoes as a side dish for dinner. My goodness, it was delish! We LOVE this smoker! Love it! This smoker is such a BREEZE to use. It’s seriously so simple. And that’s important to me because if it’s complicated or a hassle to use it’s just going to wind up sitting in the back of the garage. 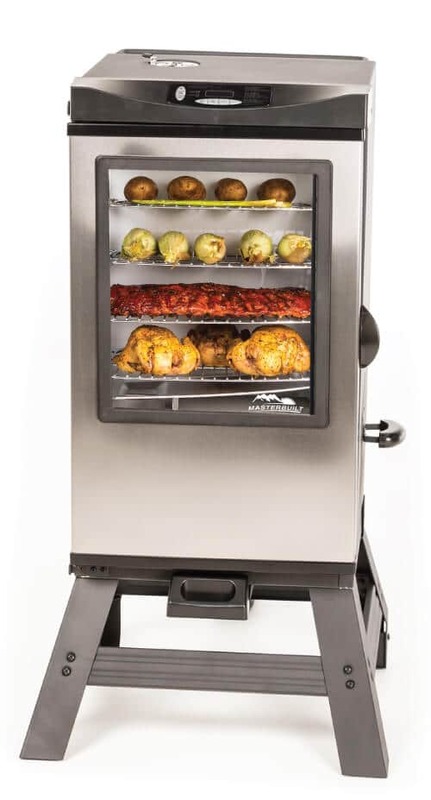 This Masterbuilt smoker is constructed in such a way that makes it intuitive and extremely easy to use. You simply plug in the smoker, set the digital controls and go about your business while the smoker does the rest. Whether you’re a beginner or a pro, if you’re looking for a great electric smoker we highly recommend the 30″ Masterbuilt Digital Electric Smoker with Window and RF Remote. For more information about their products, visit Masterbuilt’s website. Here’s a fun YouTube video I found from the Masterbuilt team to help you get your groove on! **** THIS GIVEAWAY HAS ENDED **** Congratulations to our winner, Cary! Here is your chance to win this smoker complete with several accessories! To enter the giveaway, simply leave a comment below. One winner will be randomly selected and notified via email. The winner has 48 hours to respond or another winner will be chosen. This giveaway is open to U.S. residents only. Giveaway ends October 14, 2016. Disclosure: I received this smoker without any obligation to write a positive review. I’ve used this smoker several times now, love it and wanted to share my experience with you. As always, all opinions are entirely my own. My fiance and I LOVE to smoke things! This smoker would get a ton of use in our house! I’ve no doubt it would, Justine, you guys would seriously love this thing! My husband and I would get so much use out of this smoker! It looks so easy to use and it means that there is easy clean up. That is right up my alley! Also most of the time it is localorie cooking! We do a lot of grilling as it is and when you combine smoking with that you just can’t lose. YES, Angie, it’s ease of use will definitely mean you’ll get lots of use out of it! Wow, that looks great! It sounds really easy to use. It is superbly easy to use, Diana! Ok, now I want a smoker!! This looks awesome! It’s a lot of fun, Lauren, and I’m continuing to learn more creative ways to use it! Ummm how did I not know there was an electric version of smokers?? I love smoked foods, but can’t stand fussing with a regular smoker! Oh my gosh, Amanda, it’s sooooo nice not having to worry about charcoal or propane!! I love how simple the Masterbuilt is to use and the awesome results! I should check whether it sold online and delivery availability worldwide. Or maybe I should look for local product cause I love smoked fish a lot! For sure, Citra! It’s sold on Amazon here so there’s a good chance you can find it through Amazon where you are as well. I’m making some smoked wild Alaskan salmon soon, can’t wait! There’s a pizza shop near us that smokes all of their own meats and I am in LOVE with their smoked chicken. I would love to be able to make it at home! Smoked chicken is sooooo good, Lauren! I’m trying that next! I need this in my life…we use a barrel smoker and it makes our clothes and hair smell so smokey. Ha, I’ll bet, Sandi! No smokey clothes with this one. My husband has this smoker! He bought it forever ago and has yet to use it. I feel like we need to bust ours out and get to smoking! Oh my gosh, yes, get that thing out and start smokin’!! Whoa…every single thing looks so good! You just made me want a smoker. The features on this one look particularly practical. Going to investigate! The Masterbuilt makes smoking so doggone easy, Dorothy, I love it! so happy to see this review! we’ve been looking for a smoker! Perfect timing, Jessica, I’m glad this was helpful! Oh my gosh!!! I need to get myself one of these! You do, Des, you do! And now I know what to get my hubby for his birthday! This looks amazing! I was wondering how safe it is to eat smoked foods. I love smoked foods but have read that it is dangerous due to the carcinogenic levels of the smoke. Could you, Dr. Killebrewe or someon in this thread enlighten me about this? Thanks. Hi Edward, that’s another one of those tricky topics with inconsistent research. There are many countries in Europe for example where smoked/cured meats are daily staples, yet they enjoy better health on average and have high life expectancies. I still like to play it safe though and so I recommend avoid eating smoked foods in large quantities. As with nearly everything, enjoy it in moderation. 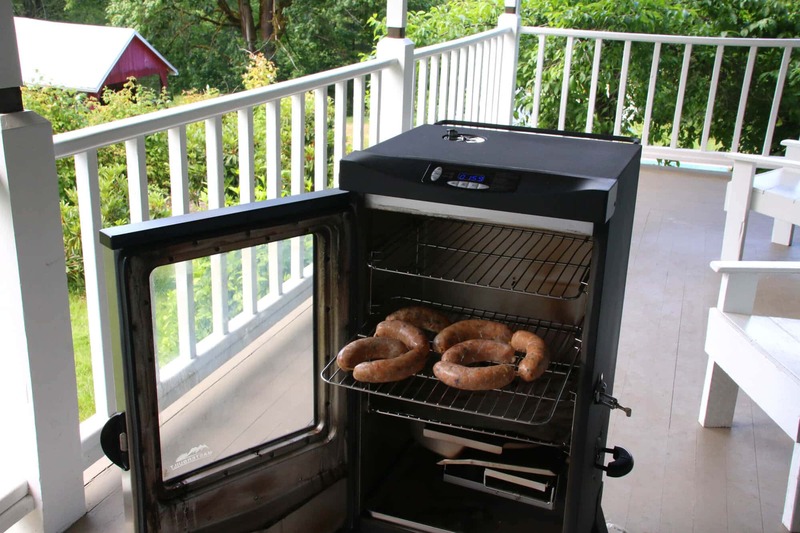 Hi Kimberly, can this smoker dehydrate food as well? Hi Jared, that’s a great question. 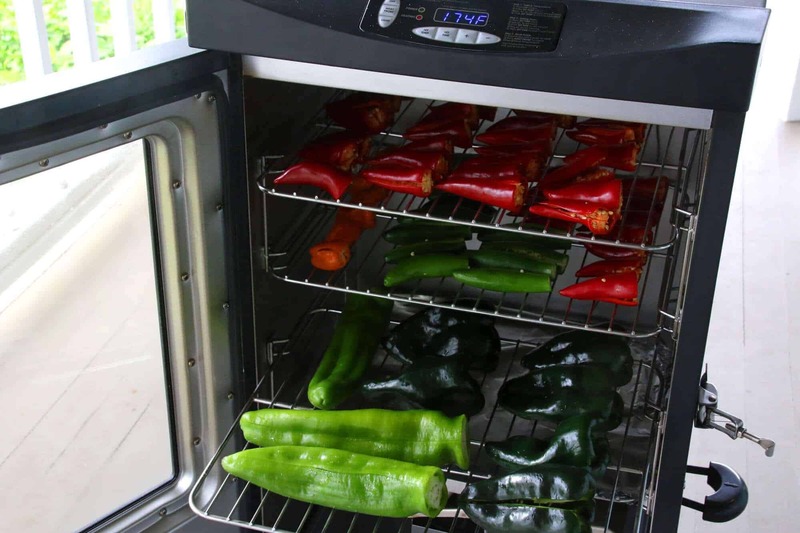 I have heard of people using their smoker as a dehydrator for stuff like jerky but it isn’t ideal because a dedicated dehydrator has a fan to increase circulation, a smoker does not. That means things will take longer to dehydrate and won’t dehydrate as evenly. You’d of course also want to avoid using any wood chips or water and keep the temperature very low. My husband loves to be outside smoking some type of meat for dinner – I need to check this one out for him! My husband saw me looking at this post and said “oo, we should get a smoker.” Hopefully we do ! This looks fantastic, something I do not have (but have been eyeing) and definitely something I would use! I’ve done the cast iron box filled with wood chips on the grill, but this looks like I would have plenty of more options in what to create. I would definitely do some of my homemade fine weisswurst, currywursts and bratwursts on this, served with brotchen and some pommes frites. Lecker! Thanks for the thorough review! My husband has been looking at this smoker for a long time, but we were never sure if it was as good as it sounded. A smoker would be a great tool to add to our cookouts! My family and I would love putting this to use! This would be an ideal way for me to continue my love of smoking food now that I have had to downsize. The dimensions are perfect for the area that I have available. I make sausages but not having a smoker, I’m limited as to what I can make. There are so many uses I can think of for a smoker of this quality (fish, ribs, chicken, etc). Oh.My.Gosh. I want this smoker!!!! Sooooo many things I could do with this! We have one of “those” simple smokers and in spite of it being old school my family just loves smoked turkey. It would be some much easier in one of these. Just thinking about all the other recipes I could do in this smoker! My first thought since it’s coming from you, Kimberly, is kassler richen and smoked salmon. lol I would use the heck out of it doing traditional Southern smokey goodness like ribs, brisket, pork shoulder too. I like the fact that it’s essentially a walk away unit. No more tending the coals and wood at 3 am doing a brisket, etc. I love cooking, and my husband and now grown sons love eating! I am always experimenting with new recipes, but often return to cooking spicy creole dishes for my husband as he is from Louisiana. 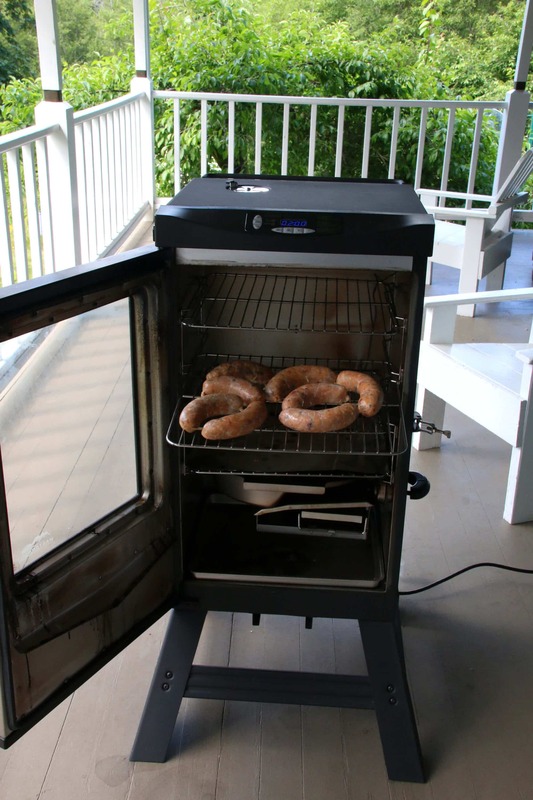 I would love to win this smoker so I can try my hand at smoked turkey, and some home-made boudin. This is just awesome! There will be 5 very happy tummies thanking you! This would be the perfect addition to my kitchen! My children and I dehydrate and can and cook together as much as possible. I would love to have this for our outdoor kitchen. We do 26# turkeys on a done charcoal bbq also prime rib. Been looking and asking on how to smoke. I would love to be able to get my hands on this. I dearly love smoked meat and fish, etc. and I like the idea of making my own. Are you kidding! Thanks for the opportunity. Living San Diego, we would certainly be using this baby all year long! Wow this looks amazing. How much energy does it use? I have not had the greatest luck smoking things on my grill, it’s so difficult to keep the temperature consistent. I need this smoker in my life. I would love to have this and expand our smoking talents. Love to have one! Absolutely love ur blog and recipes! OMG! I want to win this! I have been wanting a smoker for the last few years. This one is really nice! Ooh! Love smoked veggies and meats. Would love to win this. I would love to try this! I am Ajay imagining the possibilities! Looks amazing!! We could seriously use this and would love having one! I have this smoker at home and have cooked turkeys, rib eye roasts, while chickens, salmon and many more things this is the best little smoker very easy to use. Looks like a sweet smoker! I’ve used a Masterbuilt smoker for several years now and it is definitely time for an upgrade!! So I loved reading about his smoker. My husband and I have been seriously asking friends and family what they have, and how much do they like how their machine worked. We have had mixed reviews that are filled mostly with complaints. Thank you Kimberly for the informative read and great pictures and examples! I’ve always wanted a smoker and this one looks so easy to use! Imagine all the yummy stuff you can make with it! I would love ❤️ to have a smoker especially with the large family I have! You still amaze me! Giving me the goal to be a little more daring! I’ll throw my hat into the ring! I totally hear you about owning a smoker and never using it; I bought one last year and used it once. I WANT THIS ONE!! haha :) Thanks for the chance! I’ve always wanted a smoker- this looks like a great one to try out! This thing looks really nice and you make it look so easy, Kim! This looks like the smoker of my dreams! The one I have now is a combo unit with my grill, and it’s sooooo tiny! I love my stovetop smoker but I’m ready to graduate! Thanks for your consideration! Wow would it not be awesome to be able to smoke my own turkey and ham for Christmas and Thanksgiving with this thank you for the chance this is an awesome smoker! I would love to smoke a turkey for Thanksgiving. I have been using my weber to smoke peppers and other stuff so to me this takes all the guesswork out and looks like an absolute dream. Thank you for the chance to have this dream smoker! I love to eat smoked foods. Please enter me to win a smoker. I’ve been using a Brinkman smoked with great results but, since I turn 69 this week, an electric smoker would be so much easier. I used to put chips in my dad’s smoker when I was a kid, but haven’t ever smoked anything of my own, even though I have thought about it a few times. This one looks AMAZING! I’ve waited 30 years for a smoker this easy. Thanks for this info. My son would love this for his birthday (11/04)!! This smoker would make any cook really happy. This is so cool!!! I would love to win this smoker. I have many friends that smoke everything from deer to fish, I’ve always wanted to try smoking myself but the smokers I’ve seen so far are not very impressive. Looking and reading about this smoker, I do believe I’d love to own this one. I need to win this now. I have venison in the freezer ready to be made into smoked sausage. An efficient, easy-to-use smoker what’s not to like? This amazing machine would get a thorough work-out in our household: my beloved husband is the aficionado of smoking! This sounds wonderful. I miss eating smoked fish from Scotland. If your have ever had smoked haddock you will know what I mean. This smoker sounds amazing. We could really use this to help prepare healthy meals. This is so awesome- I love the variety of foods that can be smoked. I only own a grill- this would be amazing to have! Love smoked foods. Briskets are so wonderful smoked. Hmmm…..coincidently We’ve been looking at smokers lately. Might be the trout that have been biting…….might be the salmon or steelhead. Whatever it is we know we need a good smoker! From all that we’ve seen this looks to be the best! Next to BBQ, smoking is the ultimate flavour enhancer for me. I had made a smoker from some old metal sheets I had, but although it works fine I get a little bitter after taste which doesn’t want to go away. Its not distracting from the flavour that much, but I can imagine how food from the Masterbuilt Smoker must be tasting. This smoker would be amazing for us! It snows 7 months of the year so smoking in the garage would be a game changer!! My family and I just moved to the hi-Desert in Southern California, just minutes from the Joshua Tree National Park. There is a real rustic quality to living out here, almost a sense of living in the Old West. The air is clear, the mountains are beautiful, and it is an awesome place to live. However,probably the only thing missing from our little piece of land is a top quality smoker….. And I would love one! Thanks to the Daring Gourmet for your enticing and exotic recipes….. I am truly a fan! This smoker looks and sounds like a great way to vary the meals I could make for my family and friends. What a pleasure it would be to have this up-to-date smoker to use. Our 40 year old model is lots of work and unfortunately not used very much as it require constant attention. Those recipes sound mouth watering. Love your news letter. So informative and useful. Coming from Alaska, smoking all sort of things is a natural. I miss the wonderful flavors and a digital electric smoker would bring that all back without the back breaking labor. I can see the beautiful smoker on the deck !! Ours consisted of plywood, sort of hung together, an old electric skillet, watered wood chips, refrigerator shelving, and nails. I envision a Masterbuilt Smoker as pure heaven. This looks like. It could be really fun to play with. Have a brisket in the freezer that my little brother in Missouri gave me that would be perfect. as an avid year round “backyard professional”this smoker could open up a whole new world for me full of new meals,family enjoyment and of course lots of gloating…….. I would so love to use this smoker! I have used a fire-box type smoker for years and the latest one I’m using is now on the brink of needing to be replaced. I have been really interested in transitioning to an electric smoker and this one seems like the one to try. Thanks for all the great recipes you send out too. Just signed up on your Facebook page and then saw this! What a great give away! Would be an awesome gift for the hubby for his birthday in October! 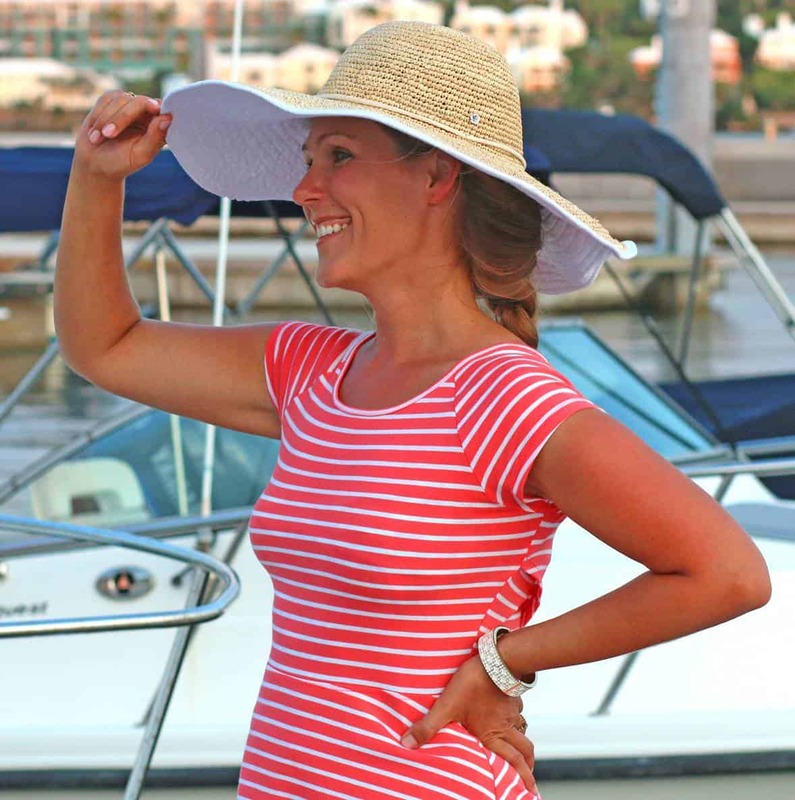 I would love to have this smoker and I love all the ways you showed how to use it! This would be awesome! I’m teaching my 13 year old grandson how to cook and he would love for us to have this! Our last smoker died some years ago & was not replaced because it was hard to use. With the apparent ease of use of this ELECTRIC SMOKER it could be used at “the drop of a hat” & what better way to save money than more Home Cooking/Smoking. I have a smoker that a friend gave me when she moved. It is not only ancient—it’s VERY basic! Like you said early in your blog it has virtually no features. I can’t adjust the (ONE!!) 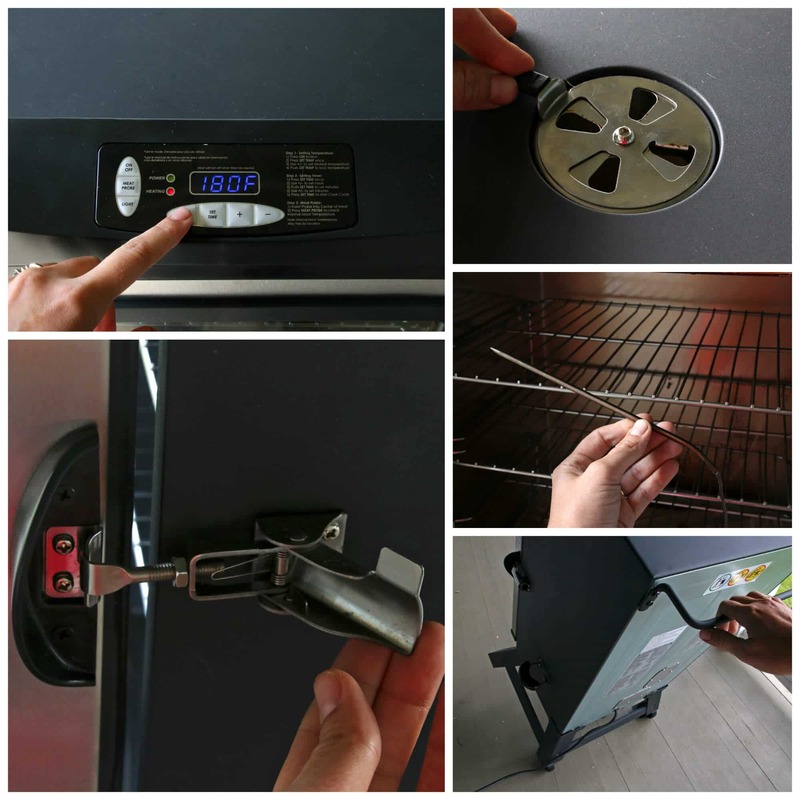 rack—or adjust temperature except by adding charcoal. While it smokes nicely and I’m grateful to have it, it would be nice to have something a little easier and more convenient to use. Have a great day everyone!!! I would love to make some smoked potato salad! Yum! Wow, this looks so much easier and cleaner than my current smoker (Big Green Egg) will have to seriously consider this smoker whether I win or not! After seeing the Masterbuilt smoker featured on QVC, I just knew I had to eventually own one. I especially like the glass door and the fact it’s RF controlled. Wow, what a joy this would be to own! We have several family parties and hold church fundraisers to benefit youth ministries and ministries overseas. Would love to start one for the homeless youth soon. My crock pots could use a break. It would be well used. Love to learn more about smoking food. This master built smoker is awesome! !The smoker is very simple to use and setup.Being made by Master Built it will last for ever.I have every thing to make sausage but the smoker.I would so love to own one of these.This would go great with the recipes found here on the The Daring Gourmet. So easy for a beginner like me to prepare food with a delicious smoky flavor that will be enjoyed by family and friends. My husband loves to smoke chickens and ribs! Would love to have this smoker. I would love to win this smoker, i smoke alot of things and this would make it alot easer to do. This would be a great thing to have for my retired hubby to “play” with. Thanks for the opportunity to win!! I only tried smoking once, and it was O.K. It was so cumbersome and time consuming. This looks so much easier. I would love to try it out! I would love to win this Masterbuilt electric smoker for the convenience of smoking meats and vegetables without all the typical barbecue equipment hassles! Oh my gosh, we were just talking about a smoker.. WOW… this looks like a terrific one for sure. We just love all things smoked !! thanks for the chance to win this one…. I am showing this to our grown children as a hint for a great Christmas present Santa could bring to our! house this year! Thanks for the recipe ideas. we have always loved the flavors of smoked foods. now that my son is a bit older, he has become quite the chef and has wanted a smoker for awhile now. he would truly love this Masterbuilt smoker AND we would truly enjoy sampling all of his masterpieces. This smoker looks amazing! It’s going to expand anyone’s horizons as a cook. Would love to have this smoker. With salmon coming in soon I would love to smoke a bunch of it! That smoker looks amazing! I would love to win it for my husband. I broil peppers often. This sounds like so much more fun. I gave my daughter an electric smoker a few years ago and she loves it. I on the other hand have an old time charcoal burning smoker. It takes a lot to get set up and continually feed more wood and charcoal. I would love to have a smoker like this to make my smoking easier. Wow! What this smoker could do to amp up Thanksgiving wou evawesome. The creations I could create for Chanukah and Passover would flip these special holidays in such unexpected ways. Gosh this smoker is amazing. We cook tons of smoked food Indian recipes which can only be done smoked … Also tend to make our own cured meats so can see this being used big time in our family once you get one. Where does one get it ? it looks and sounds like it would be easier to use than loading charcoal in a monster cooker and having to watch the heat and reload all thru the cooking process. i sure would like to try this one out,looks and sounds easy!! thanks for letting me join in. That would be a great, new toy to play with! I have an older model and it has served me well, but I’m always looking to jump to the 21st century. This looks amazing! I would love to have this and use the heck out of it! THis is an amazing prize! I’d love to win for my three boys! Thanks for the chance!! Wow, nice. I’m in the market for one of these. Would love to save that money for my kids! fantastic prize. i can’t wait to try new recipes with this great smoker! how COOL! What a great review too! I will be passing this info onto my son-in-law because he’s looking for a smoker. WOuldn’t it be fabulous to win this for him!!! My son is an Executive Chef and uses one of these for what he calls “quickie smoking”. I have a wood/charcoal smoker and gas grill and could use this much easier electric model. This article really piqued my interest. Now I HAVE to get one and start smoking! This would be fantastic and the answer to my dreams! This would be perfect! I plan on making my own sausage this year. Hope to get one soon. Smoked meats are a favorite of mine. 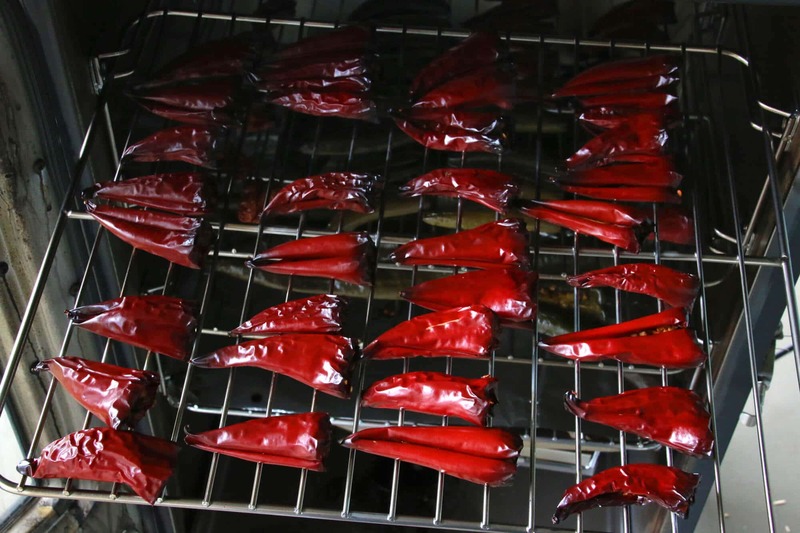 Oooh, I hadn’t thought about using a smoker to smoke and then dry chilies for homemade chili powders. Chilies are one thing that grows with no effort here in our hot dry climate! This is an awesome giveaway! We love smoke meat! Oh my gosh! My brother once owned a smoker and the delicacies he would fix! Mmmm! Just looking at the photos and reading your review has me thinking about all the delicious meals we once shared! And that smoker definitely looks less complicated than the one he had, This would be an awesome item to own! My heritage is German and I’m retiring next year. It’s the perfect size for experimenting with new ideas for sausages, perfecting small batches until it’s just right. Would love to own it. ive worn out 4 smokers already! deff need a new one! I’ve tried several brands of smokers but the Masterbilt has been the overall best. It has the best qualities around. My old smoker, although a few years old and still in working condition, will be passed on to my son to get him involved with smoking. Can’t wait to get a new one. I have just completed my outdoor kitchen and the one thing that I regret is that we did not add a smoker to the kitchen. I really enjoy cooking for friends and family and this smoker would absolutely complete our dream kitchen. Brisket, sausage, veggies and chicken, mmmm mmmm I can taste it now. Would love to try a smoker. The vegetables and meats look so delicious in your videos that I want to eat my monitor. I have a Masterbilt Turkey Frier and it works flawlessly. The smoker would be a great edition to my kitchen tools. I can just smell the aroma coming out of it. Darn, I’m getting hungry for some good old smoked ribs. Love to cook for family and friends, I can just see my friends wanting to borrow this smoker, looks like a lot of fun and versatility. I love food that has been smoked, especially Salmon, Sturgeon Ham, Ham Hocks. However, I’ve to buy these products from the store individually, as I cannot afford to buy a a Smoker, especially “The MasterBuilt Digital Smoker”, it’s beyond my reach since I am on fixed income – Social Security. It would be a dream come true to own one ! WOW, would it ever be ! I wish that I could win one of these magnificent machines ! WOW, would’nt it be wonderful !